May 24, 2017: Brooks Wachtel is an Emmy Award winning screenwriter, novelist, and producer. Brooks recently published his first novel, a thrill ride of a story called, Lady Sherlock: Circle of the Smiling Dead. He is best known for having written more than 100 produced episodes of television fiction, with shows as diverse as Fox’s live-action Young Hercules – starring Ryan Gosling, and animated hits like Spider-Man, X-Men, Heavy Gear, Robo-Cop, Beast Machines: Transformers and PBS’ Liberty’s Kids. For younger viewers, he has penned episodes of the pre-school hits, Clifford the Big Red Dog and Rainbow Fish. His episode, "I Did it My Way," for Tutenstein won him an Emmy. For The History Channel, Brooks co-created, co-wrote and executive produced many episodes of the hit series DogFights. He also wrote and produced other documentaries for that network, including episodes of Defending America: National Guard and The Coast Guard. Additionally, he wrote The Great Ships, Search and Rescue, The Royal Navy and Fly Past, which won the Cine Golden Eagle Award. Most recently he co-wrote and co-produced Silver Tsunami, an award-winning independent theatrical documentary. When not writing, Brooks serves on the Steering Committee of the Animation Writers Caucus of the Writers Guild of America, West; as well as teaching screenwriting at the UCLA Extension. And perhaps most impressive of all, he’s a performing magician member of Hollywood’s legendary Magic Castle. 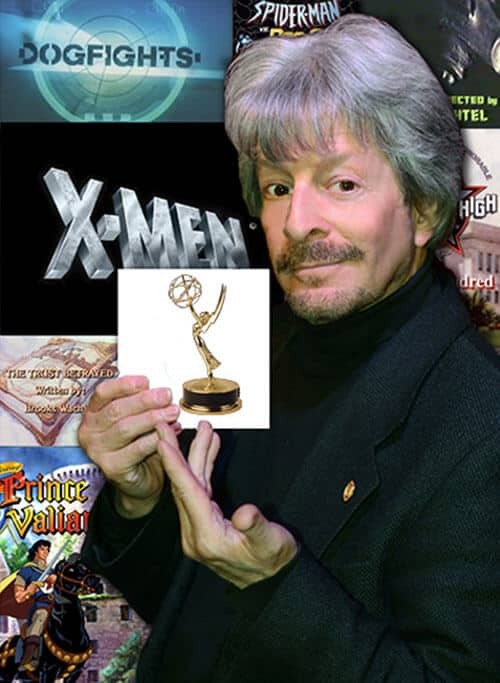 He is best known for having written more than 100 produced episodes of television fiction, with shows as diverse as Fox’s live-action Young Hercules – starring Ryan Gosling, and animated hits like Spider-Man, X-Men, Heavy Gear, Robo-Cop, Beast Machines: Transformers and PBS’ Liberty’s Kids. For younger viewers, he has penned episodes of the pre-school hits, Clifford the Big Red Dog and Rainbow Fish. His episode, “I Did it My Way,” for Tutenstein won him an Emmy.